½ cup granulated sugar for the apple stew. 3 tablespoon granulated sugar for the crumble. 1. Preheat oven to 180 degree C/360 degree F.
2. Peel, core, and slice apples into 1/4-inch slices. 3. 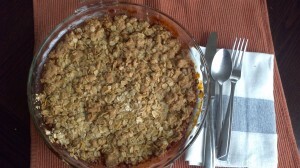 Add brown sugar and ½ cup granulated sugar to the apple and stew for 5 to 10 minutes. 4. Add cinnamonpowder and lemon juice. 5. Pour into a lightly greased 9 by 13-inch baking dish, and spread out into an even layer. Set aside. 6. In a bowl mix together maida, ½ cup oats and 3 tablespoon sugar. Using a pastry cutter or your fingers, gently work in the cold butter until pea-sized lumps are formed. 7. Top apples evenly with mixture, sprinkle the remaining oats and bake about 40 to 45 minutes.